I was in Stratford-upon-Avon on Thursday to meet Geraldine Collinge and Ian Wainwright at the Royal Shakespeare Company. Our RSC Open Stages project is progressing well: the first of the 263 amateur productions within the project took place in February 2011 on the Isle of Skye and there will be Open Stages productions across the UK through to the end of 2012. We have now completed the programme of skills sharing sessions across the country. 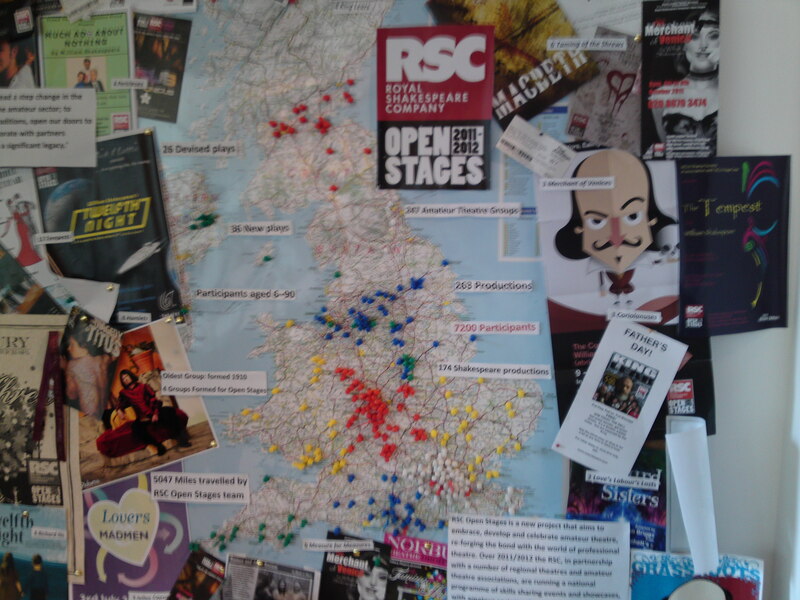 The RSC Open Stages Skills Exchange team has travelled 5,047 miles this year, running sessions from Glasgow to Southampton, working with 2,320 amateurs. The learning from these sessions has been immense and, as well as the ways in which amateur theatre groups have benefited from the knowledge and experience of the professionals, it was fascinating to hear how much the RSC has learned about the nature and state of amateur theatre in the UK. On Thursday we discussed how we might use this learning to help to plan further work together after the Open Stages project finishes at the end of 2012. We also discussed details of the regional (and national) Open Stages showcase events being organised by our 10 partner theatres in Spring 2012 and the World Shakespeare Festival/Open Stages performances in July 2012. On 14, 15, 21 and 22 July 2012 at least 10 amateur productions, selected from the Open Stages programme across the UK, will perform in Stratford-upon-Avon as guests of the Royal Shakespeare Company as part of the official World Shakespeare Festival (which is part of London 2012 Festival, the culmination of the Cultural Olympiad). It’s going to be a fantastic opportunity for the chosen groups and a great chance for us to demonstrate the excellent standards achieved by UK amateur theatre groups. 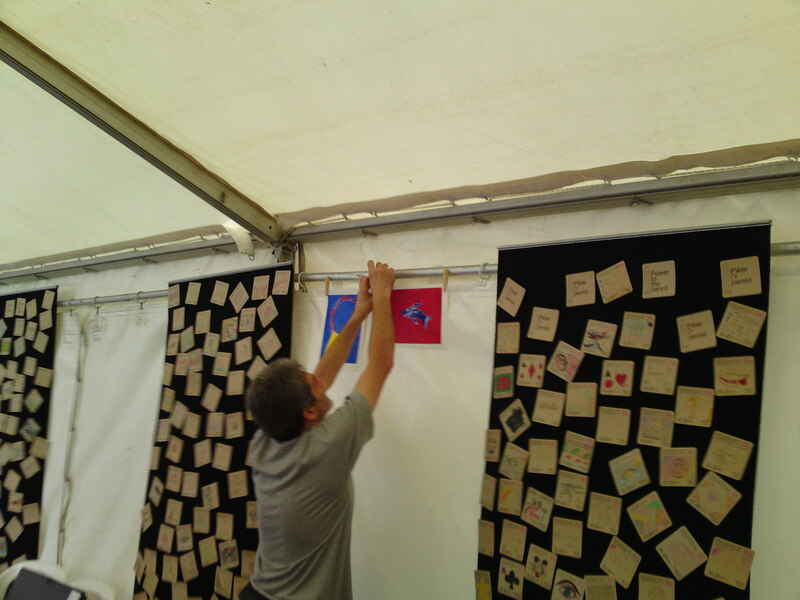 On Thursday I took part in a telephone meeting of the steering group for our Connected Communities research project ‘The role of grassroots arts activities in communities’. We discussed the arrangements for our ‘Growing the Grassroots’ consultation event at Cecil Sharp House in London on Tuesday 18 October. We also agreed plans for the publication of our literature review, final report and journal articles. On Thursday afternoon I was in the grand surroundings of the Treasury and HM Revenue and Customs building on Parliament Street in London – the new home of the Cabinet Office – for a meeting of the European Year of Volunteering 2011 working group. As well as a general update on the progress of European Year of Volunteering activities, we heard presentations from Volunteering England and Volunteer Centre Warrington on the specific strands of work focussing on employer-supported volunteering and volunteer management. We also discussed the details of the European Year of Volunteering Tour event which will take place at the Coin Street Community Centre, just off the South Bank in London, from 28 October until 3 November. I was in Edinburgh on Wednesday where Fiona, David and I met the Cabinet Secretary for Culture and External Affairs, Fiona Hyslop, at the Scottish Parliament. It was a very encouraging first meeting with the Cabinet Secretary. We talked about the nature of the voluntary arts sector in Scotland and the work of Voluntary Arts Scotland. We focussed on our People Making Waves: Make a Splash! Project (which is part of The Scottish Project to create a cultural legacy from the London 2012 Olympic and Paralympic Games in Scotland) and discussed the possibility of extending this work through to the 2014 Commonwealth Games in Glasgow. We also talked about the Year of Creative Scotland 2012, the Olympic Torch Relay in Scotland and Fiona Hyslop’s interest in supporting traditional skills, including heritage crafts. But Nick Hurd admitted this is a difficult time for the sector with much less money around. As well as hearing from the two Ministers, the seminar included presentations by Nick O’Donohoe, the Chief Executive of Big Society Capital (a social investment bank funded from dormant bank accounts and the four major UK banks) and the winner of Welsh Social Enterprise Leader 2011, Sharon Jones, the Director of the inspiring Crest Co-operative in North Wales. At the end of the seminar David Jones concluded that the groups around the room seemed generally well-disposed towards the Big Society concept, if not the Big Society brand or name. He announced plans to establish a Big Society Advisory Group for Wales and invited those present to suggest potential members for this group. 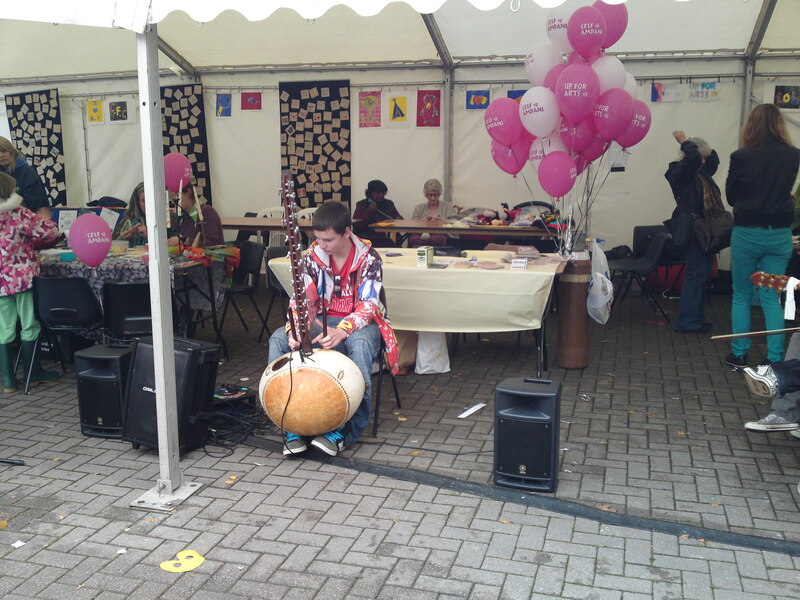 On Saturday I was in Carmarthen for our first Voluntary Arts Wales Up for Arts event. It was a great day, despite the weather. Hundreds of people stopped to take a look at the wide range of artforms and crafts being demonstrated by local amateur groups. And the occasional downpour only served to drive more people into our marquee! It was wonderful to see so many people, young and old, having a go at screen-printing, spinning, candle-making, mask-making and much more. And there were some wonderful performances in Guildhall Square throughout the day, including poetry, creative writing and lots of music. I particularly enjoyed the local teenage kora maestro – who knew that Carmarthen harboured such expertise in the West African harp-lute? 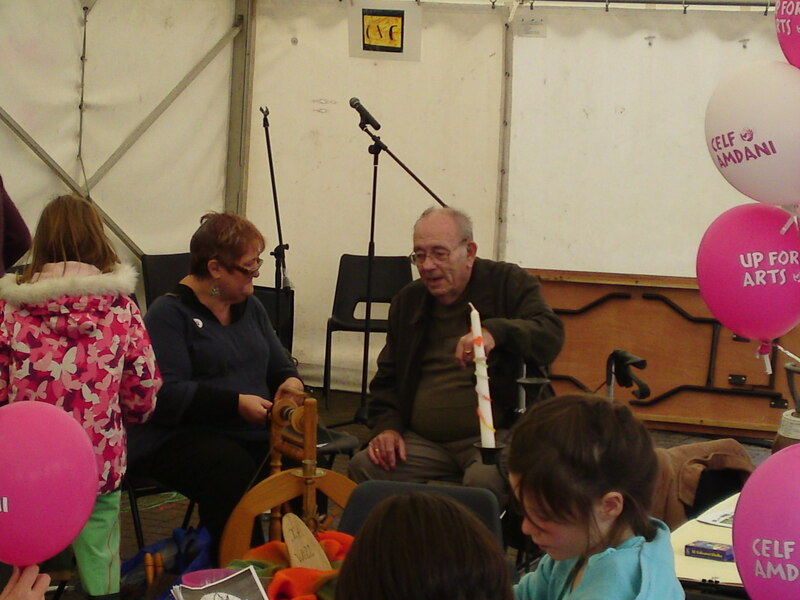 As always, the more you talk to enthusiasts from local arts groups about their particular artforms, and the more you get involved in trying the activity yourself, the more you understand the complexity, the fascination and the satisfaction of taking part. After a few minutes talking to a member of the screen-printing group on Saturday, I could see completely how it could become a real passion. Enthusiasm for any creative activity is truly infectious and what Up for Arts always achieves is to demonstrate the wealth of enthusiasm and expertise that exists in any local community. Congratulations to Fliss and Sioned for putting together a great event in Carmarthen and good luck for the second VAW Up for Arts event in Rhyl this weekend.